Along the southeast border of Calaveras County flows the Stanislaus River. This river has so many dams that almost every bridge crosses a reservoir. 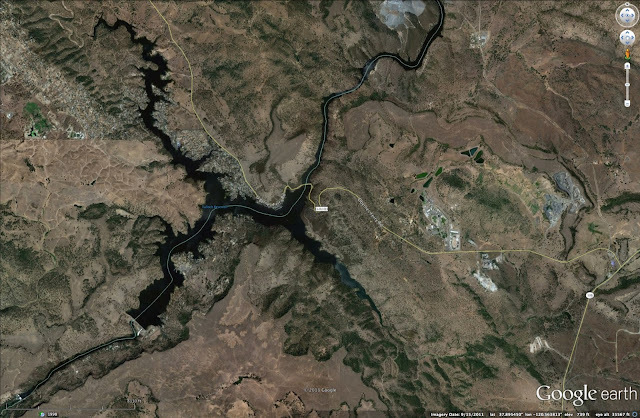 The westernmost Stanislaus River bridge along the Calaveras County border is the OByrnes Ferry Road Bridge (30C0085) across the Tulloch Reservoir. The reservoir has a funny shape because it flows into another river, giving it an 'X' or 'Aleph' shape. The bridge is a three span continuous reinforced concrete box girder structure with T girder approach spans. The main span is 155 ft long, the total length is 577 ft, and the roadway width is only 20 ft. The bridge was built in 1956 and modified in 1965. We'll take a closer look at it tomorrow. Calaveras County, California Bridges; OByrnes Ferry Road Bridge across the Stanislaus River (1) by Mark Yashinsky is licensed under a Creative Commons Attribution-NonCommercial-ShareAlike 3.0 United States License.